Get ready for a unique adventure and hunt the biggest and most dangerous beasts in this fantasy world. As Sony launches offers and services for its platform, there are many reasons to get this type of prepaid cards, which we use to fill our balance or Playstation account. They are very useful, to compare a game digitally or opt for a PSN service if we do not have another payment method. But the question of the million comes when we want to find and buy one of these PSN Cards or Playstation cards at the best possible price and as always, what all users are looking for is a fast and reliable service. For this reason, Gocdkeys is presented as the best possible alternative when it comes to finding these cards at the best price. It should be noted that all the stores that appear in Gocdkeys, are fully tested and reliable stores, and if there is any problem, which there has been, we have always solved it right away. Our PSN card price comparison service is one of the best on the internet as it includes a huge number of online stores, making it easier to find the best price. Guild Wars 2 is one of those games, MMO in particular, in which it is always good to have a little extra help, either to get hold of a weapon, aids, power-ups, dyes, ..... There are many objects that we can obtain and above all, there are many items that we would like to have and we can not for lack of funds. GW2 has a Gems shop, which is an ingame coin to be used in the internal shop of the game and has a huge catalog of useful objects, whether karma boosters, experience, Skins for our heroes, among many other objects. Well, like most MMOs on the market, we have an extra help, and it is the possibility to buy Guild Wars 2 Money Cards, or also known as Gems for GW2. With these Gems Cards, we will be able to add a certain number of Gems to our balance to be able to make ourselves with so desired objects and aids. Although it is possible to exchange game money for Gems, the truth is that the conversion rate is very high, and we must have infinite funds to have a decent amount of Gems and be able to use them in the store. Another option are the well-known Gems Cards, either 2000 or 1200, and there are many stores that offer these prepaid cards and from Gocdkeys we have the perfect option for anyone who wants to add these valuable currencies in their account. The 2000 Gems cards, which have a price of approximately 16€, and the 1200 Gems cards, with a very similar price, so we always recommend buying the 2000 Gems card. How do we activate GW2 Gems cards? The first thing you have to do is log into Guild Wars 2 with the account in which you want to unlock the gems. Then, we'll have to open the Black Lion Trading Company panel. The default key is [O]. You can also click on the lion icon at the top left of the screen. Select the "Redeem code" button at the top left of the store's home page and follow the brief, simple instructions that will appear. Once this is done, we will have the Gems in our account to spend on what we want. Playstation Plus for everyone and super cheap! What is PS Plus and what does it offer? Playstation Plus is one of those services that if you take advantage of it well can give you many benefits when playing. It is the service of Playstation par excellence, which will allow you to get all kinds of games and offers for your PS console, services and exclusive benefits to members, with the first registration we will receive access to 10 free games and much more. But most importantly, it offers you the possibility to play online against other players or with your friends. If you are interested in PS Plus multiplayer games, it's indispensable! Currently, we have two types of these PS prepaid cards on the market: The 3-month card and the 12-month card. The physical version of these cards does not make much sense, as they will send you a physical card that includes a code, and that means waiting a few days until you get home. 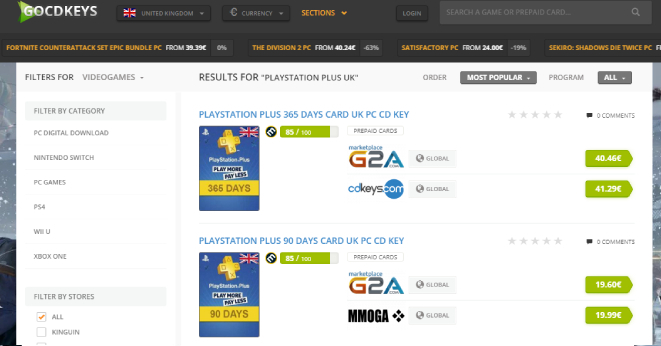 so for PS Plus subscription cards we always recommend buying them in digital version. The digital version, you will simply receive in your email a code that you must enter in your Playstation account to activate. Later we will explain how to activate it in a simple way. 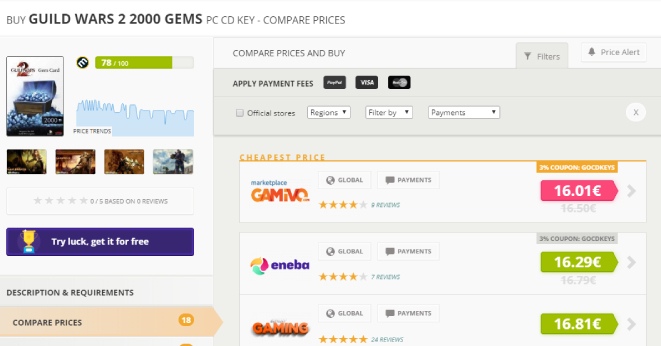 From Gocdkeys always offer the best prices of the moment, updated daily, so you will be very easy to find these super cheap subscription cards. Both cards have a much lower price than in the official Playstation store, so we recommend that you don't even think about buying them. And once purchased, how do we redeem the PS Plus code? It is very simple and the activation of the code is instantaneous once we introduce it. Simply go to the Playstation store, access our account, and in the menu on the left, at the bottom, we'll see a section that says "Redeem codes" That's where we must enter the 12-digit key and that's it. How much subscription time do I have left? To see how much time we still have left to subscribe to the PS Plus service, simply go to the Playstation website https://store.playstation.com and access your account. You will then be able to see how much time you have left. If you want to see it from your PS4 console, simply go to "Settings", "Account Management", "Account Information" and "Account Information" There you can see when the subscription expires. Remember that this service is cumulative, ie we can buy all the cards that we want the time will add. for example, if we buy two 12-month cards, we will have 2 years of subscription service. Please note: When you enter a code, Sony's bad guys will activate automatic renewal for you, so if you run out of time Sony will charge you again for the service, so you need to be aware of or deactivate this "Automatic Renewal" right after you redeem your PS Plus code. That's it. Now you just have to remember to enter our price comparator each time your PS Plus subscription expires to find the best prices for these indispensable Playstation cards. Why buy Nintendo eShop cards? Nintendo eShop cards are one of the most demanded products through the Internet and from our price comparator. With the triumph of Nintendo's latest handheld it has become fashionable to buy Nintendo eShop credit cards, as the Nintendo store offers many services that we can use with our account balance. The main reason for purchasing these eShop cards is that we will be able to purchase the games offered by Nintendo quickly and instantly, and then download it to our Nintendo Switch. If you don't have a credit card, or simply want to fund your Nintendo eShop account cheaper than paying directly at the official Nintendo store, this is the perfect option. Currently, we have available 3 Nintendo eShop cards that will offer us different balances for our account. It should be noted that these cards are in digital format, ie when you buy any of these three eShop cards, we will receive a key or code and later we will see how to activate. The 15€ Nintendo eShop cards, which we can currently find for 14€. The Nintendo eShop cards of 25€, which has a price of 23.99€. 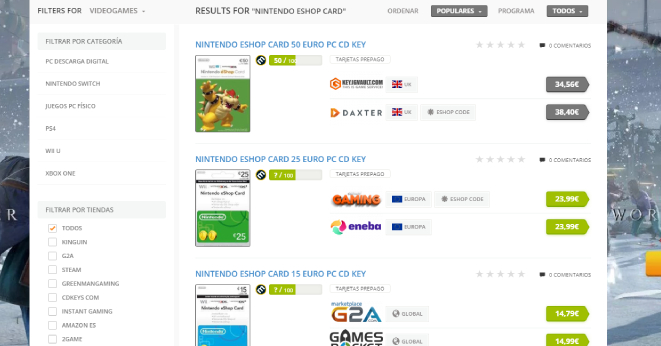 And the 50€ Nintendo eShop cards, with an approximate price of 38€ for the US version and 46€ for the European version. Remember that from our "Price Alarm" you can set a price notice, with which we will notify you when any of these products falls below a certain price, so you can always get these prepaid cards at the best possible price. Important: It should be noted that these balance cards for Nintendo have regional blocking, ie, different versions are sold for each of the regions, either for U.S., for UK, for Europe, ... And their prices can vary significantly for each region. From our card price comparator for this Nintendo service, you can filter by activation regions depending on your preferences. Once you have purchased your eShop credit card, how do we activate it? Once the Nintendo eShop card has been purchased, we will receive a code in our email that we must activate. To do this, and like PSN Plus cards or Xbox One cards, Nintendo eShop cards can be activated directly from our account on the Nintendo website. If you redeem it from your Nintendo Switch, just go to the eShop in the console menu, and in the left side column select "Redeem code". It is in this section where we must enter the code we have received. To redeem the code via your computer, simply log into your Nintendo Network account on Nintendo's official website and the text box where you must redeem the code will appear. Once the Nintendo prepaid card is activated, we'll see how it appears instantly in our account, so we'll be able to start buying Nintendo games with that balance.